Good a bit rickity, you need to tighten the inner workings so it doesn’t fall apart but nice looking. 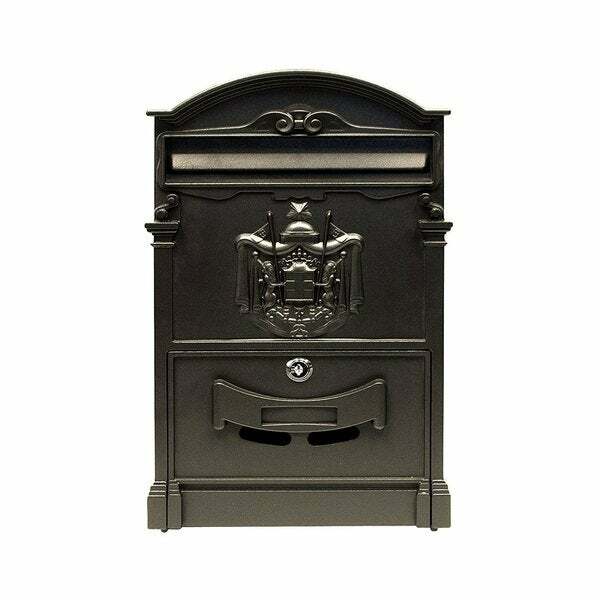 This elegant black hanging mail box, is made to be very sturdy to withstand any weather once you attach it. Difficult to dent or break into this box. Constructed to have thicker width walls for safety of your personal mail. Beautiful protruding design on the front of two lions holding a symbol. Highly detailed look. Very nice addition to the front of your home or office space. 16 Inches high by 9.5 Inches wide with a thickness of 3 Inches, perfect for holding mail. 2 keys included with mail box, also includes 4 metal bolts and 4 wall anchors . Well made fits large amounts of mail. One improvement to this model for perfection would be arm rack underneath to capture large roll of junk mail/magazines, etc. LOVE this little mailbox! It's discreet yet sleek accessory for my new home. I love that the door comes with a lock and keys, keeps my mail secure while I'm away. Highly recommend! Absolutely gorgeous! I can’t wait for it to be hung up!!! Along with my new porch light. My wonderful husband works long hours and has only two days a week off. So hopefully by next week I will be able to take pictures of the duo. Love this mailbox! It's bigger and nicer then expected. Can't wait to put this up. Will match perfectly with the exterior light I bought from here!